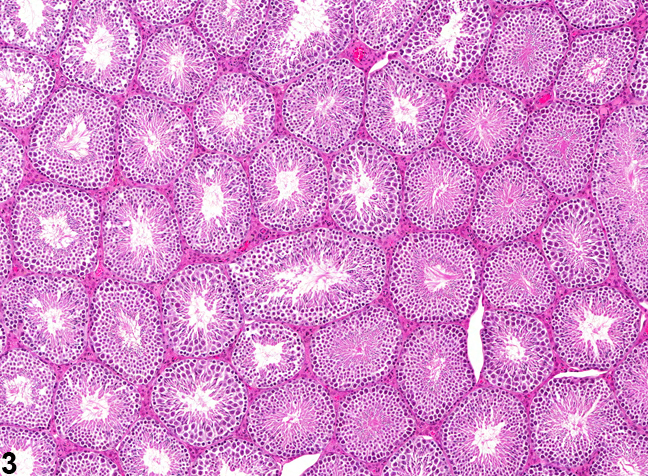 Testis, Seminiferous tubule - Dilation in a male B6C3F1 mouse from a chronic study. These seminiferous tubules are dilated. 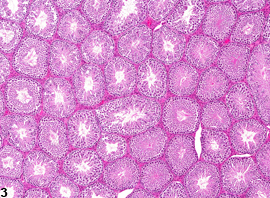 Testis, Seminiferous tubule - Dilation in a male B6C3F1 mouse in a chronic study. 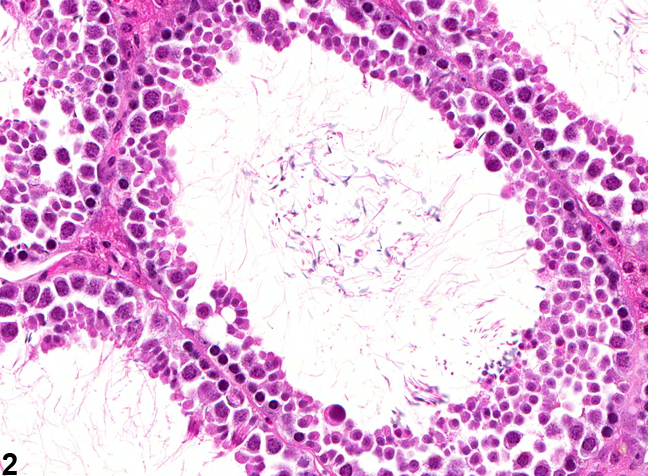 This higher magnification of Figure 1 shows a dilated seminiferous tubule with a reduced population of germinal epithelium. 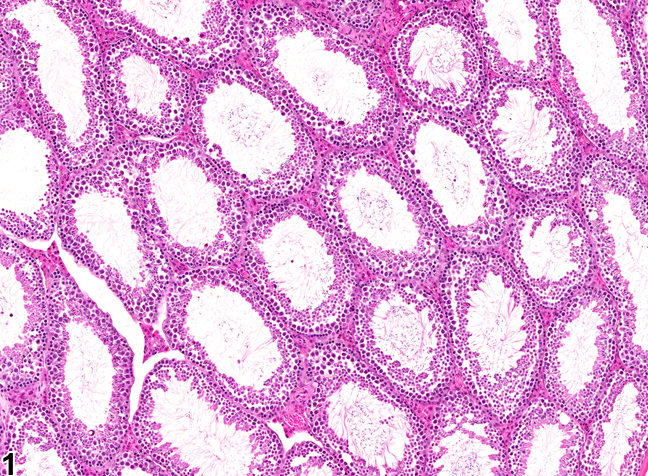 Testis - Normal in a male B6C3F1 mouse from a chronic study. Normal seminiferous tubules for comparison with Figure 1. 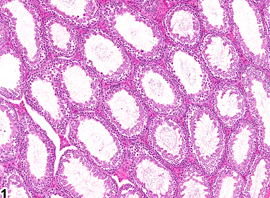 Testis - Normal in a male B6C3F1 mouse from a chronic study. Normal seminiferous tubules for comparison with Figure 2. Seminiferous tubule dilation is characterized by increased luminal diameter of the seminiferous tubules ( Figure 1 and Figure 2 ). 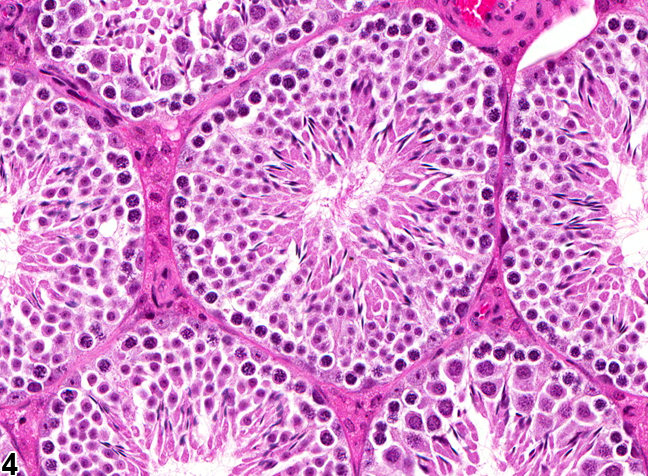 This contrasts with the inconspicuous luminal space in the seminiferous tubules from a normal testis ( Figure 3 and Figure 4 ). 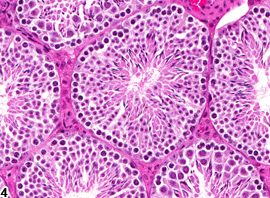 The affected tubules have thinning and compression of the seminiferous epithelium, which is caused by pressure buildup from increased volume of seminiferous tubule fluid within the lumen. The increased fluid can be due to decreased reabsorption of fluid in the efferent ducts, efferent duct blockage, decreased emptying of fluid from the seminiferous tubules, or increased production of seminiferous tubule fluid by the Sertoli cells. If the fluid pressure is maintained, the tubular dilation can rapidly progress to severe germinal epithelial atrophy, resulting in an irreversible cessation of spermatogenesis. When the tubular dilation is secondary to blockage of the efferent ducts, the lesion may be unilateral, and yet the cause of the blockage can still be test article related. Unless the efferent ducts are sampled (which is difficult in rodents), the cause of the tubular dilation will not be apparent. The ERKO mouse develops seminiferous tubular dilation followed by severe germinal epithelial atrophy as it reaches puberty. This occurs as a secondary consequence to the failure of the efferent ducts to resorb seminiferous tubule fluid, which is an estrogen-dependent function. Seminiferous tubular dilatation with its sequel of atrophy has been reported for a number of chemicals, including the fungicide carbendazim, a PDE4 inhibitor, a leukotriene inhibitor, and endothelin antagonists. Tubular dilatation should be diagnosed and graded and should be discussed in the pathology narrative if the incidence and/or severity appears to be related to chemical administration. When present, bilateral involvement should be recorded because unilaterality usually reflects a secondary response to lesions in the efferent ducts. Attention should also be paid to the incidence of unilateral or bilateral seminiferous tubule atrophy since this can be a progressive and end-stage lesion of tubular dilation. 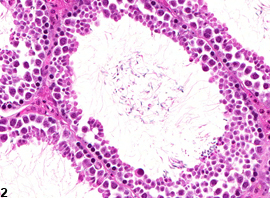 Attention should also be paid to any evidence of gross or microscopic lesions within the initial segment of the epididymis or the epididymal fat pad (location of the efferent ducts) that may reflect sperm granulomas, sperm stasis, or dilated ducts, which would indicate the likely origin of the initiating, obstructive lesion. Creasy DM. 2001. Pathogenesis of male reproductive toxicity. Toxicol Pathol 29:64-76. Creasy DM. 2012. Reproduction of the rat, primate, dog and pig. In: Background Lesions in Laboratory Animals: A Colour Atlas (McKinnes E, ed). Saunders Elselvier, Edinburgh. 101-122. Creasy D, Bube A, de Rijk E, Kandori H, Kuwahara M, Masson R, Nolte T, Reams R, Regan K, Rehm S, Rogerson P, Whitney K. (2012). Proliferative and nonproliferative lesions of the rat and mouse male reproductive system. Toxicol Pathol 40:40S-121S. Eddy EM, Washburn TF, Bunch DO, Goulding EH, Gladen BC, Lubahn DB, Korach KS. 1996. Targeted disruption of the estrogen receptor gene in male mice causes alteration of spermatogenesis and infertility. Endocrinology 137:4796-4805. Hess RA. 1998. Effects of environmental toxicants on the efferent ducts, epididymis and fertility. J Reprod Fertil Suppl 53:247-259. Hess RA. 2002. The efferent ductules: Structure and function. In: The Epididymis: From Molecules to Clinical Practice (Robaire B, Hinton BT, eds). Kluwer /Plenum, New York, 49-80. La DK, Johnson CA, Creasy DM, Hess RA, Baxter E, Pereira M, Snook SS. 2011. Efferent duct toxicity with secondary testicular changes in rats following administration of a novel leukotriene A4 hydrolase inhibitor. Toxicol Pathol 40:705-714. Mecklenburg L, Ockert D, Kemkowski J, Kohler M. 2013. Selective inhibition of PDE4 in Wistar rats can lead to dilatation in the testis, efferent ducts and epididymis and subsequent formation of sperm granulomas. Toxicol Pathol 41:615-627. Nakai M, Hess RA, More BJ, Guttroff RF, Strader LF, Linder RE. 1992. Acute and long-term effects of a single dose of the fungicide carbendazim (methyl 2-benzimidazole carbamate) on the male reproductive system in the rat. J Androl 13:507-518. Piner J, Sutherland M, Millar M, Turner K, Newall D, Sharpe RM. 2002. Changes in vascular dynamics of the adult rat testis leading to transient accumulation of seminiferous tubule fluid after administration of a novel 5-hydroxytryptamine (5HT) agonist. Reprod Toxicol 16:141-150.